We have an energy crisis. Yet often, large spaces usable for energy generation remain unused for the purpose. Take water surfaces: in many cases, large bodies of water such as lakes may have some shoreline activity (beaches for sunbathing and a bit of swimming), and perhaps a few recreational sailing boats on them, but remain largely unused for any other purposes: wasted space! And even if there is commercial shipping, these ships would only use lanes to get from A to B, and not require the whole lake surface. A floating device (float) is mass-produced, ideally from recycled hard plastic/PVC, in a colour that blends well into the surrounding environment (dark greens or blues depending on the surrounding landscape). The size of the float will be between perhaps 5×5 meters and 25×25 meters, depending on the local requirement, and does not have to be square but could also be round, rectangular, or oval (boat-shaped). 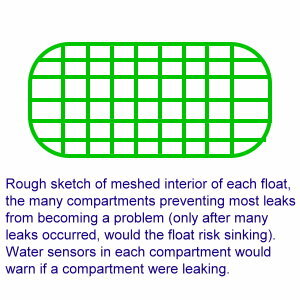 The body of the float would be hollow to ensure good flotation, and have a honeycomb-like interior (compartmentized, in say 1×1 ft compartments), so that should a leak occur only a very small compartment would flood and the rest of the float would not be affected (this to ensure long life-expectancy with low maintenance: even with multiple holes in it, a float would continue to float and function). On all sides of each float would be spacers (probably sticks or frames with rubber bumpers, made from recycled tyres, at the end) to keep the floats at a minimum distance from each other (there would need to be a gap of at least a few feet between each float to ensure water oxygenation and proper separation of the floats). Cheap water sensors could be fitted in each compartment, in order to “report to base” whether that particular compartment has a leak. Floats with too many leaks could then be taken in for recycling or repair based on this automated diagnosis, without someone having to go out and check for leaks. For stabilisation, the float would have a keel filled with ballast (which could be recycled materials such as mine tailings, concrete from demolished buildings, or scrap metal depending on local availability). Windmills or wind-grids (see my other post “A New Kind of Wind Energy“). These would be mounted on poles or masts above the surface of the float. Solar cells. The surface of the float (which, depending on local conditions could either be more or less flat, or angled) would be covered in these. Alternatively or additionally, extra solar cells could be mounted as panels on poles (at a level below the windmills, so as not to interfere with them). Tide fans or turbines. These would be mounted on the bottom of the float, under water, and generate electricity by capturing the tide or the water flow, for example in a river. Tide fans may not be useful everywhere, for example in lakes without any water currents they could not be used (however in that case, perhaps commercial fish farms could be constructed underneath the floats, with nets hanging off of them; alternatively, “eco fish farms”, aimed at regenerating depleted fish species for environmental purposes, could be created using the floats, enhancing the floats’ environmental benefits). All equipment mounted on the float should be easy to remove/replace, so that any faulty elements could be swapped out within minutes. Mounts should be engineered so that even after years of exposure to the elements, they should be removable without tools or only a basic one such as a hand-operated screwdriver, and there should never be more than one screw to hold each element, if at all possible (particularly, no materials susceptible to any type of corrosion should be used). 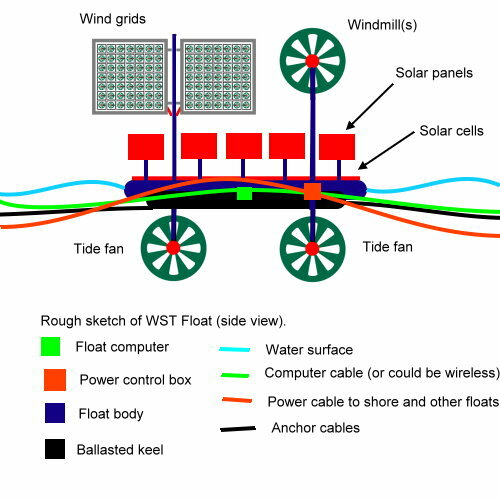 Floats positioned in a specific area would be connected together, and one or more of the floats closest to the shore would have a cable going to shore through which all energy from the floats would pass to dry land. On land, the energy would be processed and pumped into the grid. Alternatively, it could be used to convert water into oxygen and hydrogen, so it can be stored and used later on in fuel cells (this is perhaps a more complex way of dealing with the power). Each float would have a small, basic computer which would monitor the leak sensors, and the functioning of the components such as windmills and solar cells. This way, malfunctions could be detected remotely. Likewise, each float would have a power control box which would monitor power and condition it/protect against spikes or other malfunctions, so that the grid of floats would not be affected by a single unit malfunctioning. Depending on the local conditions, floats could be equipped with a rudder and one or more small electro motors, to keep floats positioned in a certain orientation so as to make best use of the sun and wind. However it may be possible to avoid this by clever design of the float surface elements, particularly the positioning of the solar panels. Floats could be used on lakes (in large clusters, covering massive areas away from land and invisible to the public to avoid complaints about visual pollution; if sufficient surface is covered, it will prevent the wind from whipping up large waves, so it would also serve to pacify larger lakes). They could be used on rivers (for example lining the banks when they are not used for other purposes, leaving the centre of the river free for shipping) and they could be used in sheltered bays on the coast. Floats would need to be anchored (either to land, or to the lake, river or seabed); to save costs, a group of floats should be able to use the same anchor. The design of the anchoring system should allow for secure anchoring, but also very easy undoing of the anchoring so that any faulty floats could be swapped out by no more than two men in a small (tug)boat (to keep maintenance costs of the float farm down). Massive versions of them, specially designed and constructed to withstand the open sea, could conceivably be developed for use off-shore. Cost will need to be brought down by agressive marketing and global deployment of these floats, so that large factories can be built for their manufacture, which will also be able to use massive amounts of recycled plastics, encouraging plastic recycling. The mass production should enable component costs to be low. Some of the floats could be equipped with environmental sensors (monitoring wind speed, temperature, water conditions, sunlight intensity, pollutants in water and air, etc.) and report the data back via the computer network of the floats. As an added bonus, the undersides of floats could be designed in a way, and perhaps covered with materials, that would encourage inhabitation by water life (such as fish, and in the ocean, corals or seaweeds). This would add to biodiversity and help “sell” the concept of the floats to the public in areas where there could be opposition.